Here is a demonstration of how to use the GS-0006-ABCD tube set. The other sets I sell are similar regarding setup and use. This set allows a straight push and even distribution of force on each block. It also allows the press bed to stay in one (01) position. 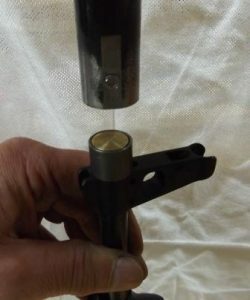 These photographs show a flanged spigot fixture I use to secure the barrel. 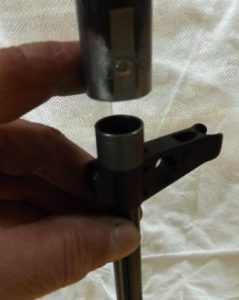 In these photographs the barrel has been pressed to firm headspace but not pinned, so this flanged spigot secures the barrel and supports it at the chamber face. 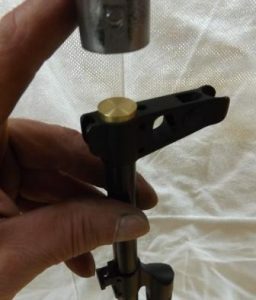 If this breech block was in a receiver, then a different support tool is used. In this photograph the barrel is set to firm headspace and mounted on the flanged spigot fixture. 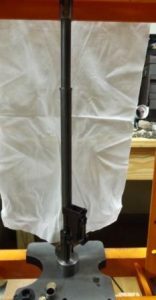 The rear sight block is placed on the barrel and the long tube, washer, and intermediate-length tube are stacked and with a single push the rear sight block is safely in place. Now, the lower handguard retainer and the piston guide tube are slipped onto the barrel as is the gas block. The intermediate-length tube is touching the gas block and with a single push it is safely in place. 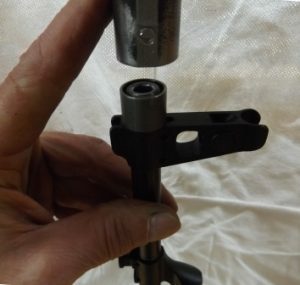 The front sight requires a couple of extra steps in order to (a) protect the threads, and (b) set the distance of 15,2mm from the muzzle to the front sight. The brass block shown is just a unit made from scrap and any soft and clean metal disk or plate is fine. The front sight is pressed until it is flush with the muzzle. The 0.30″ caliber centering puck is inserted into the muzzle. The puck is larger than the outside diameter of the muzzle thread and does not allow the short sleeve to touch it. 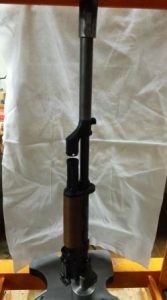 The short tube is placed against the front sight. The brass centering puck is still in place but hidden from view. With a single push the tube is pressed until its end is flush with the brass centering puck. 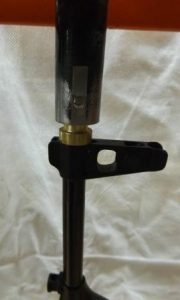 The brass centering puck is removed and the tube is used to press the from sight to its correct distance from the muzzle. The distance is correct when the end of the tube is flush with the muzzle. Correct any block clocking errors and the assembly is ready to pin!